Liz Lutgendorff, Phd student at Oxford Brookes and Chair of Conway Hall Ethical Society, has provided the NSRN with an informative overview of the archive facilities offered by Conway Hall in London which may be helpful to researchers of secularism and nonreligion. Guest edited by: John R. Shook Ph.D., Ralph W. Ho od Jr.
Ph.D., and Thomas J. Coleman III. disciplines ranging from cognitive science to religious studies, and from anthropology to sociology. The study of atheism and secularity is of high interest to not only scholars, but also the public in general. In the spring of 1969 an International Symposium on the Culture of Unbelief was held in Rome, organized by the Vatican Secretariat for Unbelievers, with the participation of illustrious sociologists like Parsons, Berger and Luckmann: see R. Caporale, A. Grumelli (eds. ), The Culture of Unbelief, University of California Press, 1971 (published in Italian as Religione e ateismo nelle società secolarizzate, Mulino, 1972). This pioneering experience sought to understand the evolution of the secularization then taking place. Later, the topics of religious non-belonging, indifference, agnosticism, ceased to attract the specific attention of sociologists, who began taking a greater interest in pluralism, globalization, multiple modernity and intercultural phenomena. But for some years now the issue of non-religious attitudes and behaviour has come to the fore again. The Sociology of Religion review devoted most of one of its recent issues (Winter 2013, with two essays by Stephen LeDrew and one by Jesse M. Smith) to the phenomenon of atheism. The Journal for the Scientific Study of Religion (March 2013) also showed an interest in unbelief by publishing essays by Jesse M. Smith (Godless Community), Eran Shor and David J. Roelfs (Nonreligious Participation). Previously the Journal of Contemporary Religion had devoted a special issue (January 2012) to the topic of “Non Religion and Secularity”. The time seems to have come for sociology to take stock of the situation, not merely in partial or territorial terms, but in a much broader sense, in order to obtain a better understanding of the dynamics presently at play in this area. Among other things, it is significant that, in the meantime, a neologism, previously unknown to the literature of sociology has been coined: Nones, those who deny, do not believe, do not belong, do not participate, do not pray, do not refer at all to values of a religious nature. However, adequate statistical references and specific research devoted entirely to the issue of unbelief are lacking. Without claiming to present a comprehensive picture of the situation at world level, nevertheless, the intention underscoring this proposal is that of trying to provide as varied an analytical perspective as possible, one capable of acting, maybe, as a new starting point for a future sociology of non-religion. The launch of the NYUP’s book series on Secular Studies was announced earlier this year and is seeking submissions, details attached. The Secular Studies series is meant to provide a home for works in the emerging field of secular studies. 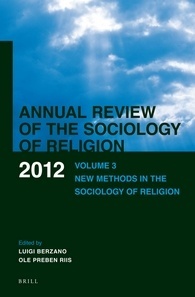 Rooted in a social science perspective, it will explore and illuminate various aspects of secular life, ranging from how secular people live their lives and how they construct their identities to the activities of secular social movements, from the demographics of secularism to the ways in which secularity intersects with other social processes, identities, patterns, and issues. What is the function of logic in al-Kindī’s corpus? What kind of relation does it have with mathematics? This article tackles these questions by examining al-Kindī’s theory of categories as it was presented in his epistle On the Number of Aristotle’s Books (Fī Kammiyyat kutub Arisṭū), from which we can learn about his special attitude towards Aristotle theory of categories and his interpretation, as well. Al-Kindī treats the Categories as a logical book, but in a manner different from that of the classical Aristotelian tradition. He ascribes a special status to the categories Quantity (kammiyya) and Quality (kayfiyya), whereas the rest of the categories are thought to be no more than different combinations of these two categories with the category Substance. The discussion will pay special attention to the function of the categories of Quantity and Quality as mediators between logic and mathematics. Norman Bonney, ‘Established religion, parliamentary devolution and new state religion in the United Kingdom’, Published online in Parliamentary Affairs 2012. Parliamentary devolution in the UK since 1999 has had the effect of trimming the significance of Church establishment in the UK and introducing alternative expressions of official religosity and secularism in the proceedings of the devolved parliament and assemblies in Scotland, Northern Ireland and Wales. The Church of England remains as the official state church of the United Kingdom performing religious services for the UK Parliament and state but the elected devolved institutions have devised alternative arrangements in relation to their own business with a secular Welsh National Assembly, silent contemplation in place of daily prayers in the Northern Ireland Legislative Assembly and a multi-faith Time for Reflection in the Scottish Parliament. The article examines the origins and reasoning of the new parliamentary bodies for abandoning the practice of Anglican prayers and adopting innovative contemporary solutions to the perennial tensions between the spheres of politics and religion. A new publication has been announced of interest to the NSRN. Contributors below include the NSRN director Stephen Bullivant and other contributors to our upcoming annual conference. Grace Davie, Phil Zuckerman, Teemu Taira, Thomas Zenk, Teuvo Laitila, Tiina Mahlamäki, Gavin Hyman, Mattias Martinson, Stuart McAnulla, Stephen Bullivant, Lise Kanckos, Mikko Sillfors. AR is published by the Donner Institute for Research in Religious and Cultural History in Åbo, Finland. Its purpose is to publish current research on religion and to offer a platform for scholarly co-operation and debate within the field. The journal appears twice a year and consists of articles and book reviews. It addresses an international readership and, as the title suggests, approaches the field of religion from a broad perspective, engaging contributors from different theoretical and methodological traditions.